A Roman tile dug up in Gloucester, UK revealed a little surprise when an archaeologist discovered little cat paw prints impressed into it. A Roman era tile dug up in Gloucester, UK revealed a little surprise last month when an archaeologist with the city museum discovered little cat prints impressed into it. 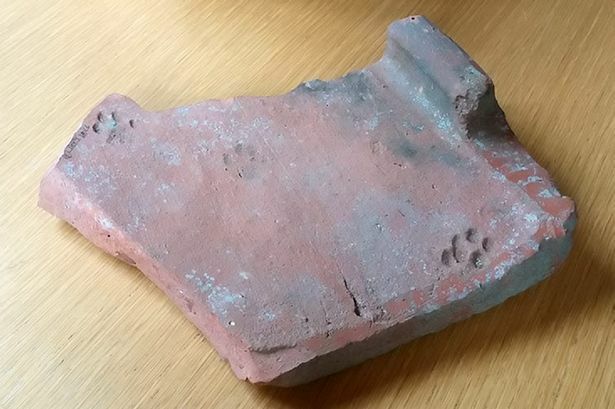 The cat’s paw prints were found on a red clay Roman roof tile dug up with thousands of other tiles and fragments in Berkeley Street in the city in 1969. The clay tiles were left in the sun to dry and harden when they were made nearly 2,000 years ago, and animals and people sometimes walked over them, leaving footprints behind. The tile is thought to date from about AD 100. The tile can be viewed at the The City Museum and Art Gallery in Gloucester.